I’m a LONG time Microsoft Windows user, I’ve been using Windows since before many of you were born…I was using Windows 3.11 when it was 16-bit way back in 1996. And before that I used DOS. 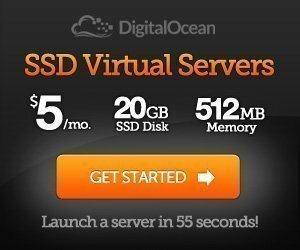 I’ve used Windows 3.11, Windows NT, Windows 95, Windows 98, Windows 98 SE & ME (blurgh), Windows 2000, Windows XP, Windows Vista and I absolutely LOVE Windows 7 64-Bit – that’s what I use on all my machines now. To be honest I’ve been looking forwards to Windows 8as they’ve concentrated a lot more on the UI/UX aspects (which is where Apple has historically been strongest). Windows has had all the features Apple has had for YEARS, they just never polished them up or marketed them properly (with catchy names like TimeMachine). 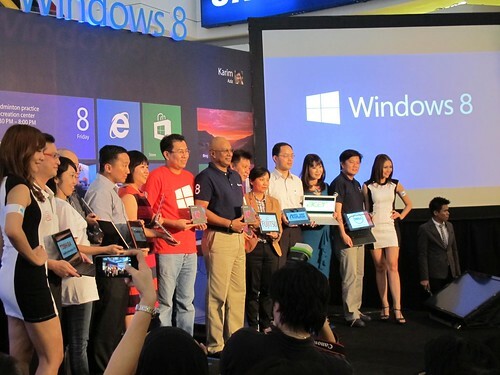 I could see that changing in Windows 7 and they seem to be getting there with Windows 8. 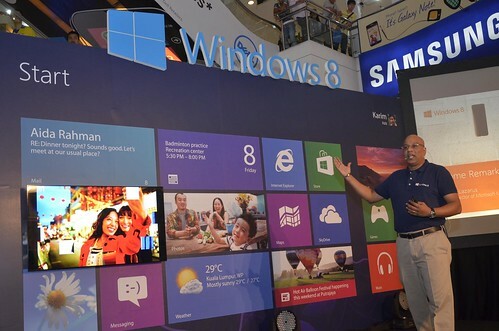 Plus Windows 8 has a massive focus on cross device user experience, tailored for touch screen so it works amazingly well on your phone and you get the same seamless experience on your tablet and your touch screen laptop/notebook. There is a desktop mode too (for those dinosaurs like me who love the keyboard). 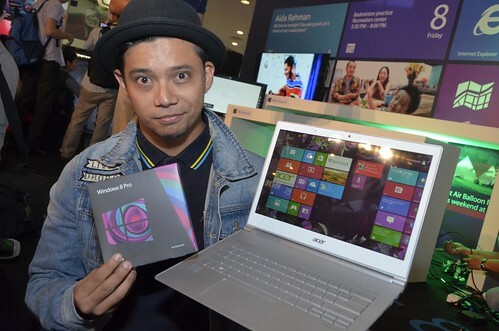 Anyway back to the launch, it was held in Plaza Low Yat on Monday October 29th 2012 (yah 2 days after my wedding!) and it was packed! 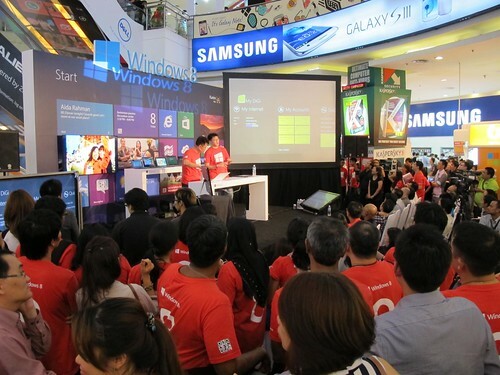 There was a great welcome speech by Ananth Lazarus the Managing Director of Microsoft Malaysia. There was also Noh a local celebrity & musician from the band Hujan highlighting the Passion8 project which will be aired on 8TV over 8 weeks. I was really impressed by the range of devices available during the launch, all kinds of cool form factors – the majority being laptops/notebooks/ultrabooks which transformed somehow into a tablet (by folding/sliding or simply detaching the screen). 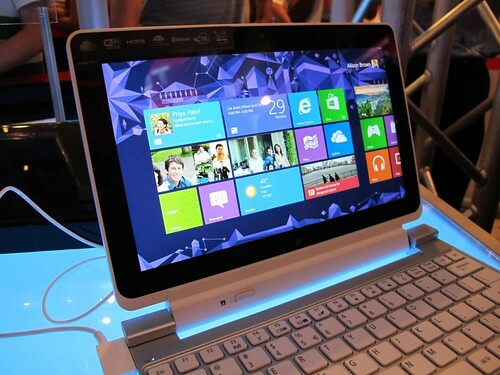 There were devices from Acer, Asus, Dell, Fujitsu, HP, Lenovo, LG, Samsung, Sony, and Toshiba. 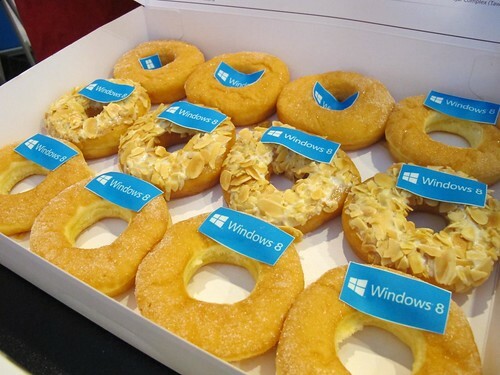 They even had cute Windows 8 donuts! Got my W8 Pro so long also haven’t install, busy settling many other things. Definitely going to buy 1 or 2 more for my other devices, they’re going at USD 39.99. Try playing Cut The Rope on some devices, like say Asus VivoTab, and you’ll see that it’s sluggish compared to say the experience on an iPad (1st gen) or various Android tablets.